Get your copy of The Step today! A thrilling memoir where the space race and sexual revolution collide, The Step, is a riveting memoir about Martha Lemasters’ years working on the Apollo Program. During a time where few women worked, and men at Cape Kennedy outnumbered women 200 to 1, Lemasters worked her way up from typist to PR writer and found personal and professional happiness and success along the way. A fabulous read that you won’t be able to put down, The Step is inspiring and enlightening. Find out what is was like to have a front row seat to one of the greatest accomplishments of all mankind. Order your copy today. 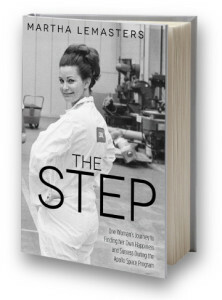 The Step is available for purchase on Amazon.com, Barnes & Noble, BooksaMillion, Indiebound.org and many other retail locations.